It is our mission to promote health and healing…every person, every time. 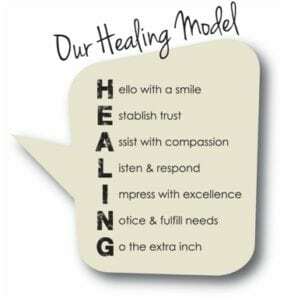 Were you “wowed” by a member of our team demonstrating a characteristic in our HEALING MODEL? What could we have done to exceed your expectations? WE HEAR U. COMPLETE OUR 7-QUESTION SURVEY & YOU MAY BE THE WINNER OF OUR MONTHLY DRAWING!